Attractive, fresh and dry white wine with light tropical flavours. An excellent aperitif and will partner nibbles or chicken/fish dishes well. Juicy blackberry and cherry flavours with lovely purity of fruit. An easy-drinking red, which is good on its own or with nibbles and will partner pasta brilliantly. Bags of spicy damson/berry fruit. A dry, full-bodied red made from old-vine garnacha with a smooth finish. Great with roasted meats, tapas and spicy sausages. 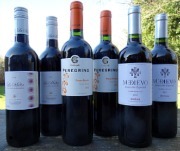 Made by talented Scottish wine maker Norrel Robertson MW, who now lives and works in Spain! Spicy blackberry fruit with vanilla hints from 3 months in oak barrels. Blackberry and redcurrant fruit flavours. This is a firm, full-bodied red with with well balanced tannins; a definite food wine. Try it with casseroles and pork dishes. Blackberry and spice flavours with cedary notes from 6 months in American oak barrels. A modern Rioja with great fruit, complexity and a smooth finish. Excellent partner with roast meats. A touch of apricots and citrus fruit on the nose, coupled with a refreshing, citrus and peach flavours. It has a smooth, complex, and long finish. A brilliant blend of Godello, Treixadura and Albariño from DO Monterrei in Galicia. Year on year John Forrest’s classic Sauvignon Blanc becomes more like a Sancerre. It has aromas of nettles and tangy gooseberries, and a hint of passion fruit on the palate, which makes this an elegant kiwi Sauvignon that ages gracefully. 2012 is really drinking well. This is very Chablis like. A delicious unoaked Chardonnay with complex aromas of apples and honeyed citrus fruits and a smooth, enigmatic tropical and citrus fruit palate. One of our all time favourites from a small producer we discovered some 12 years ago. The flavours go on and on! Dry, crisp and refined white with attractive elderflower and lime marmalade nose and palate; there is a touch of greengage here too which makes this 11% abv white wine a stunning aperitif and will accompany fish and chicken. This is just off dry and delicately flavoured Riesling with apple, mandarin and apricot flavours. The light touch of sweetness is brilliantly balanced with citrus. A brilliant aperitif or lunch time wine at 8.5% abv. Blackberry and redcurrant fruit flavours, this is a firm, fresh red with nice touch of light oak from 3 months in oak barrels. It is best drunk with food, especially roast meats, casseroles and cheeses. Medium-bodied. Juicy, young red with cherry fruit and spice flavours and fresh tannins. This wine will continue to develop through 2015. It will partner chicken, pork and charcuterie really well. Medium-bodied. Concentrated and complex red with cherries, ripe plums coupled with hints of spice and balsam. This is the same grape as mourvedre which plays a starring role in Chateauneuf du Pape. 6 months oak-aged. Full-bodied. Blackberries and hints of leather aromas lead into succulent, spicy black fruits coupled with great structure and length; very moreish, fresh and full-bodied at the same time! This is a real star; drink with game, beef, casseroles. Lovely biscuity mid palate and beautifully balanced with crisp fruit freshness on the brilliant long finish. Refined fizz that beat Moet Chandon and Veuve Cliquot in a blind Tasting last year. Champagne in all but name! Elegant Sauvignon Blanc with classic light gooseberry and grapefruit hints with a very long, subtle, flinty finish. Akin to a Pouilly Fume style. This is top notch Sauvignon from a cool climate area of S Africa. Packed with layers of apricot, peach and citrus flavours with amazing length, gained from 20 months on the lees. Complex, smooth with a refreshing tang. A very special white wine that will partner fish or great on its own. Strawberry, blackberry and plum flavours with hints of fruit cake and spice. Medium-textured, complex and savoury, this succulent Pinot Noir will be the perfect partner with turkey, chicken or game birds. This is more like a Reserva in elegance, complexity and depth of flavours. Rich blackcurrant aromas lead into concentrated, structure black fruit flavours. Cañas make elegant wines with fruit wrapped in silky, oak laced layers.